Profits at Dixons Carphone plunged by 60% in the first half as people shunned expensive mobile phones and held onto their old handsets for longer. 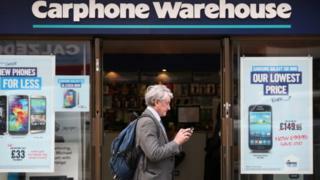 The electricals retailer said like-for-like sales in mobile fell by 3% in the first six months of its financial year. Dixons Carphone warned on profits in August because of changes in the phone market. Chief executive Seb James said it was "tougher" but he was taking action to change its mobile business. Shares in Dixons Carphone rose by 7.9% following the announcement. Pre-tax profits fell to £61m in the six months to 28 October compared with £154m in the same period last year on group sales down 1% at £4.8bn. Like-for-like sales, which strip out revenue from new shops opened during the period, rose by 4%. However, this was due to stronger turnover in Dixons Carphone's electricals business as well as its divisions in Greece and the Nordic region. The company also pointed out that "the later launch of the iPhone X pushed some sales into the second half of our financial year". Mr James told the BBC's Today programme: "Mobile phones have become rather expensive. Things have definitely gone up in price quite a lot. "The new iPhone X, for instance, which is a beautiful piece of kit but it is £1,000 so a number of people are saying 'my phone is still working. I'll wait until this one conks out before I get a new one'." He said that Dixons Carphone will now look for a third party to finance handset sales. He said: "At the moment, we have got very used to in the UK that you walk into a phone shop, you pay perhaps a small upfront deposit, you get your phone and then you pay a monthly fee." Mr James said that will continue, but: "The question is who's paying for the phone at the moment - we're paying for the phone." He said that in the future the company will find a finance house to take on that function. "We're not a very good bank but we are, we hope, a very good retailer," he said. Mr James said the company will adapt its phone division to "reduce the complexity and capital intensity of our mobile business model, and increase the simplicity and profitability of what we do." "For simpler and less capital intensive, read store closures," said Neil Wilson, senior market analyst at ETX Capital, who said that the number of the company's shops represents "an opportunity rather than a problem". "With over 700 Carphone stores in a total estate in excess of 1,000 across the group, there is ample opportunity to rationalise the Carphone estate and improve profitability in mobile while still retaining a dominant market position," he said. However, just 10% of the square footage across the company's 1,000 stores is devoted to Carphone Warehouse, the rest is taken up by Curry's and PC World, which sell larger electrical goods. A spokesman for Dixons Carphone said there were no plans at present to sell stores. The company now expects full-year pre-tax profits to reach between £360m and £400m compared with £510m in the previous 12 months. The forecast is lower than the £360m-£440m range Dixons Carphone outlined in August when it warned on profits. It said it had made a "good start" to its peak trading season. Mr James said the company "had an all-time record Black Friday in all of our territories" and generated nearly £500m over the period. He said that Black Friday was now the busiest trading time for the company, followed by Boxing Day week. Why does no-one want a new phone these days?